Woodcliff Lake, NJ – July 27, 2016- MINI TAKES THE STATES 2016 (MTTS), the legendary two-week cross-country rally for MINI owners and enthusiasts, came to an end this weekend at The Thermal Club in Palm Springs, Calif., after an epic 4,397 mile adventure that started at Atlanta Motor Speedway on July 9th. Travelling through two national parks and eight race tracks, the biennial trek attracted a record 4,000 plus MINI owners over the two weeks, with more than 900 owners going “all the way”. At times the group swelled to more than 1,500 owners and 700 MINI vehicles of all shapes, colors and sizes. 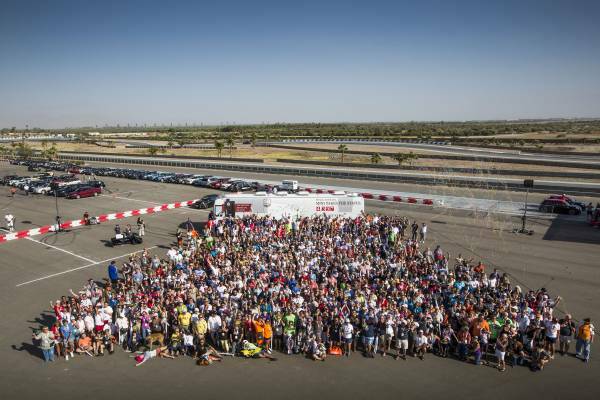 Although the loyal MINI community never needs a reason to rally, this year they motored with a purpose. The group, with participants from all over the U.S. and around the world, took to America’s country backroads and freeways to #DefyHunger with charity partner Feeding America . By the time the rally had come to a close at the Thermal Club, the group had raised enough money to provide more than one million meals to help people facing hunger though their fundraising efforts, easily topping the initial goal of 800,000 meals. The two-week adventure through 14 cities in 15 days kicked off with a team of parachutists who dove from planes 3,000 feet in the sky towards a fleet of MINI Convertibles filled with food donations, asking everyone in attendance to “jump in” to help #DefyHunger. Official press photos and b-roll from the entire 14-day event are available for download on MINIUSANEWS.com. Browse through a collection of amazing stories from the road captured by the MINI USA team on the MTTS 2016 Blog on MINIUSANEWS.com. Media interested in updates on MINI USA can also follow us on Twitter at @MINIUSANEWS.